"It's like a haircut. You take a little off but you go to much it's hard to put back on"
In a backyard shop in the woods of St. Tammany Parish, an old-fashioned musical sound is brought to life. Joe Manuel got his first guitar at the age of ten, although his first lessons didn't work out. , a friend down the street, and the teacher said don't bring him back"
Phil Patterson was introduced to guitar at the same age. "I was always into the vintage instruments and the specifications and the studying of them and Phil was into the nuts and bolts of putting them together," Manuel said. wood, into beautiful sounding stringed instruments. 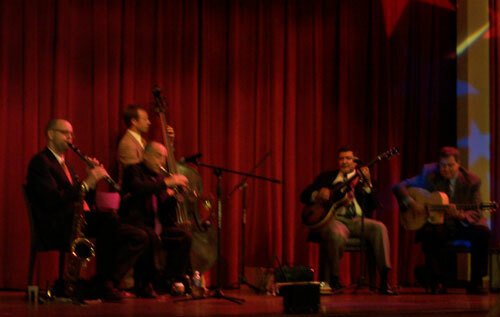 Phil Patterson & Joe Manuel are passionate about fine and vintage instruments. Collectively, the pair have been repairing, restoring, collecting and playing vintage string instruments for nearly half a century and designing and building guitars since 1990.
is especially evident in the extraordinary finish work. 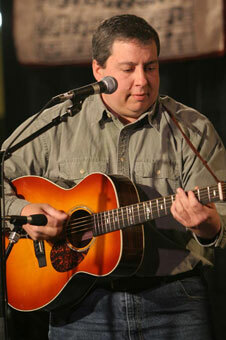 A gifted classically trained guitarist, Phil also teaches and performs. he also teaches, composes, records and performs music. 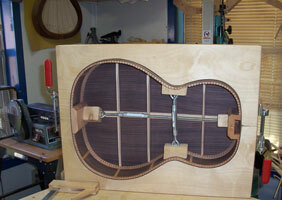 are built into each Manuel & Patterson Guitar. 12 fret 00-45. " 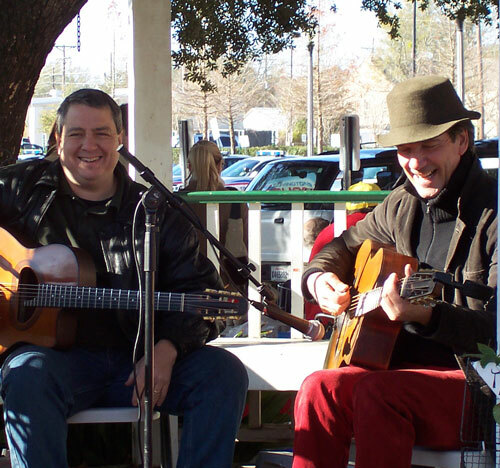 Norman & Nancy Blake really sparked our interest in 12 fret guitars "
Phil Patterson and Joe Manuel, of the Abita Springs Guitar Company, bring diverse musical backgrounds and a variety of skills to each and every custom guitar they build. 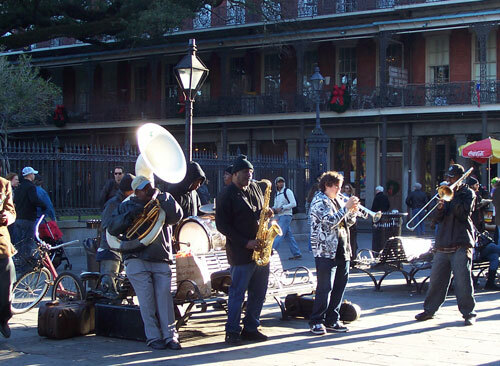 They understand musicians because they are both highly talented musicians themselves. 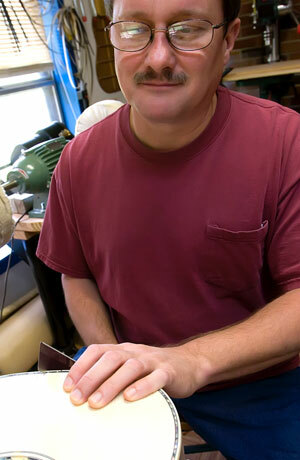 They understand guitar design because they have both spent years repairing and restoring vintage instruments. They understand music sales and the needs of their customers because they both worked for many years in the retail music business. And they both understand the needs of guitar students and professionals as they both have spent a long time teaching guitar lessons to students and performing professionally. When you sit down to discuss your custom dream guitar with these two builders, you can rest assured that they understand your wants, needs, and desires. 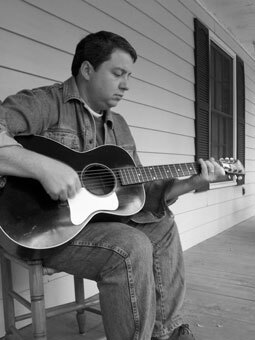 Phil Patterson grew up in Birmingham, Alabama, and studied classical guitar at Loyola. 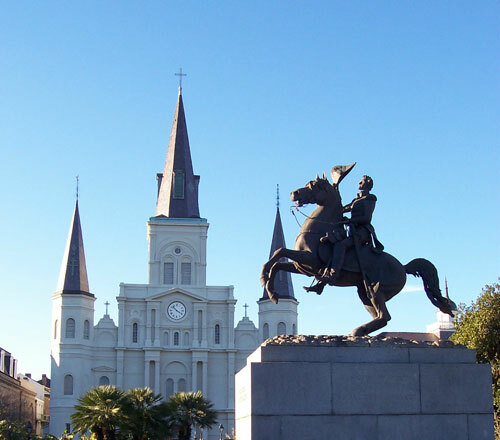 After having spent time as an apprentice guitar repairman, he was hired to repair guitars and teach lessons at a store in Covington, Louisiana, in 1983. About three years later Joe Manuel was hired to sell guitars at the same shop. The two musicians worked well together. Joe ran the sales department and Phil ran the repair shop. Joe said, We worked on a lot of vintage guitars and we sold acoustic guitars built by Martin, Taylor, Gibson, Santa Cruz, and others. We built the store up to a pro guitar shop with a good reputation. Joe also started collecting vinta ge instruments. By 1990 they decided that they would try working together to build instruments. The first guitars the two built were custom electrics. 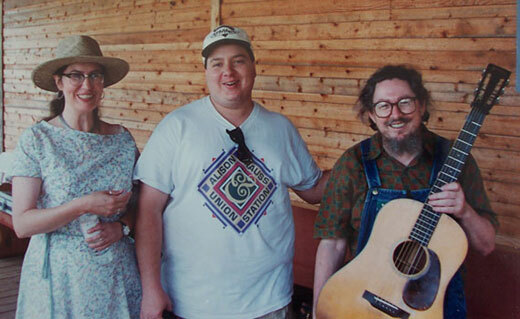 Later, in 1993, they built their first D-28 style acoustic guitar. 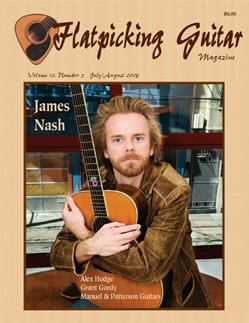 Joe said, When we built the first few acoustic guitars we did everything together. We worked on them in the store after hours as a side project, so they took a long time to build. Jimmy Foster, best known for his archtops, sprayed the finish on the first guitar for us and has been a lot of help over the years. By the time they had built six or seven acoustic guitars people who came by the shop and played them expressed interest in having a custom guitar built. A new business was born. In 2004, the owner of the store where Phil and Joe worked was ready to get out of the retail music business. He offered to sell the store to Phil and Joe, but Joe said that by that time they were not interested in owning a guitar store. They wanted to focus on repairing and building instruments. So they started the Albita Springs Guitar Company and began full time work selling their guitars under the Manuel & Patterson name. 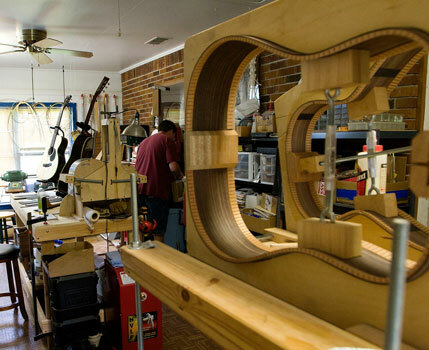 All of the guitars that Manuel & Patterson build are custom instruments. 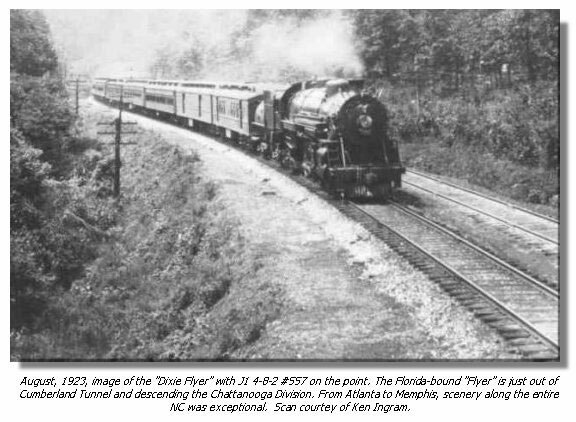 They have set models as far as the body styles are concerned, but after that, everything can be customized. Joe said, We offer custom 12-fret and 14-fret single 0, 00, 000, D, and Jumbo body styles and we also have built combinations with different scale lengths, body depths, bracing patterns, fretboard widths, neck shapes, and about anything else that the customer might desire. We spend a lot of time with each individual customer to help them get exactly what they are looking for in a custom guitar. Joe said, Years ago Leo Fender said that building an acoustic guitar was more an art than a science, and that is the way we approach building each guitar every step of the way. We are very selective in picking out the right woods, and our braces come from the same piece of wood that we use for the top. 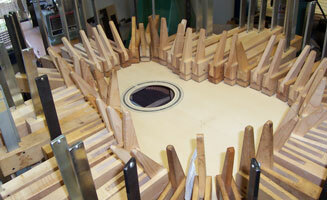 We pay very close attention to wood thickness and I am emphatic about keeping the thickness of the finish thin. 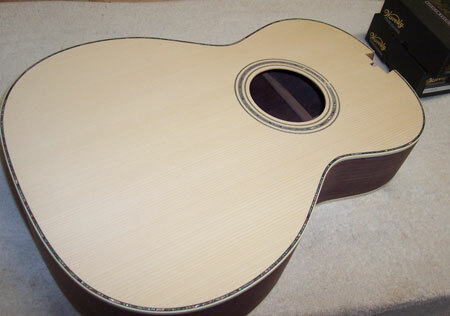 After a while you develop an instinct for all of the fine details that come together to make a top quality acoustic guitar. When asked how the Manuel & Patterson standard Dreadnoughts might differ from the old Martin designs, Joe said, Generally our Dreadnoughts have a slightly larger soundhole. Our braces are also a little taller than the standard Martin. 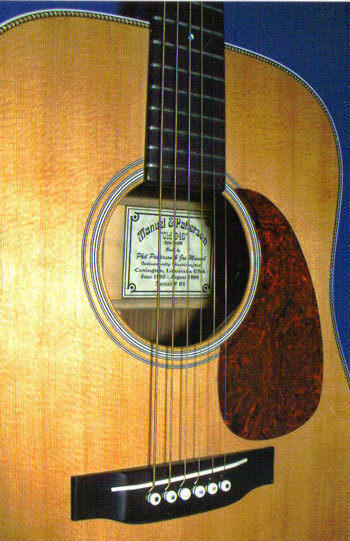 The brace height and taper is more like the Gibson J-30. So our braces and bracing pattern are combinations of the Gibson and Martin designs. We scallop both sides of the transverse brace, but we don't feather it on the treble side. We leave a little more meat there. Our tops are also a little thinner on the bass side. We try to build our guitars so that they have a good clear sound all the way up the neck. Other standard features include hand voiced (scalloped) braces; ebony fingerboard and bridge; ebony or Madagascar rosewood headstock overlay, heel cap, and end piece; polished high-gloss lacquer finish; bone nut and bridge saddle; two-way action truss rod; and Gotoh or Waverly tuners. 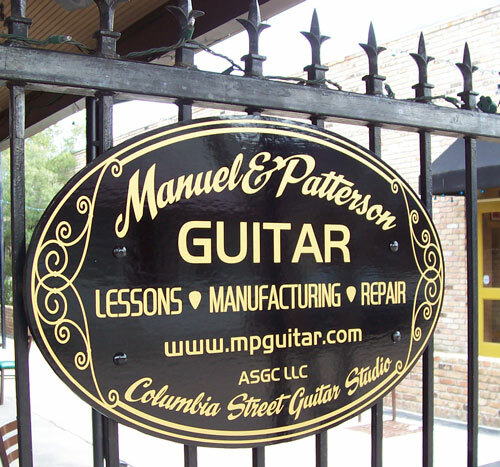 Beyond just a few of the general building details, it is difficult to talk specifically about the Manuel & Patterson guitar designs and appointments since almost all of their work is custom. The type of woods, the neck shape, the neck width, and virtually all other aspects of the guitar's design are selected by the customer, with Phil and Joe providing expert guidance along the way. Browsing their website one will see a 00-12 sunburst slot-head with an Engleman spruce top; a 000-14 with a bearclaw Sitka spruce top and figured mahogany back and sides and Nick Lucas style inlays; a 00-12 with an Adirondack top and Brazilian rosewood back and sides, and abalone vine inlay; a Indian Trail Adirondack/Brazilian Dreanought; and many more. 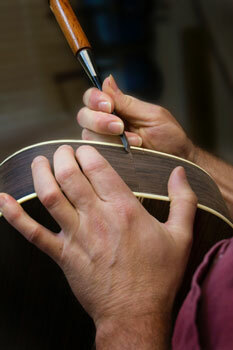 Every guitar is built to the customer's sonic and cosmetic specifications. Most models sell in the $2,500 to $4,000 price range. 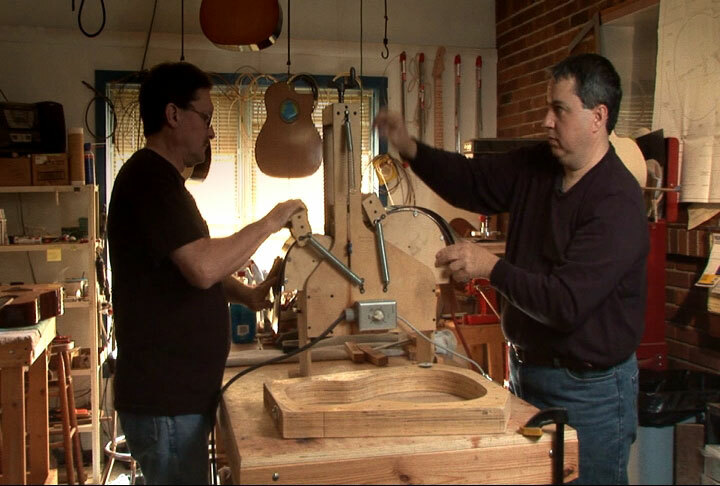 As far as dividing up the work effort, Joe takes care of building the guitar's body and shaping the neck, Phil does the final sanding, fretting, and the finish work. Both work on the inlay. 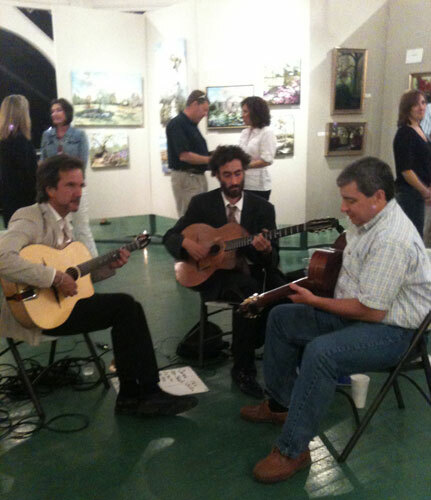 All of the Manuel & Patterson owners who I've met and talked to are extremely enthusiastic about their guitars. John Greene, of Bush, Louisiana, raved about his Manuel & Patterson guitars when he came by the Flatpicking Guitar Magazine booth at Merlefest. He said, Every time I get an opportunity to pick with a new group of folks, people will comment on the guitar's looks. Then, when they hear how it sounds they'll usually ask if they can play it. I've had a chance to play it in different settings with various vintage and new instruments and it never takes a back seat in either tone or volume. or other musical venue where Joe Manuel is playing, one cannot help but be dazzled by the sounds flowing from his acoustic guitar. While Joe is a guitar wizard with abilities far beyond us lesser mortals, he is armed with a not-so-secret weapon that captivates audiences. 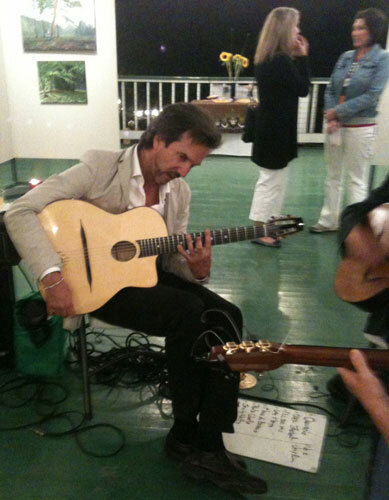 Joe plays a Manuel & Patterson guitar. sought by players and collectors around the world. 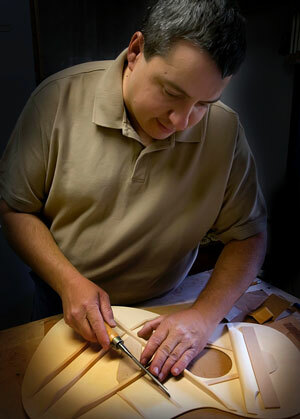 , ebony, Adirondack and Sitka spruce, western red cedar, Hawaiian koa, and Honduran mahogany, Joe and Phil work closely with each of their clients, carefully crafting instruments to satisfy their playing needs. The customer can choose from a variety of body styles, order custom mother-of-pearl or abalone neck and headstock inlays, select a neck width that's ideally suited for their hand size, and complete the order with a striking sunburst or natural lacquer finish. 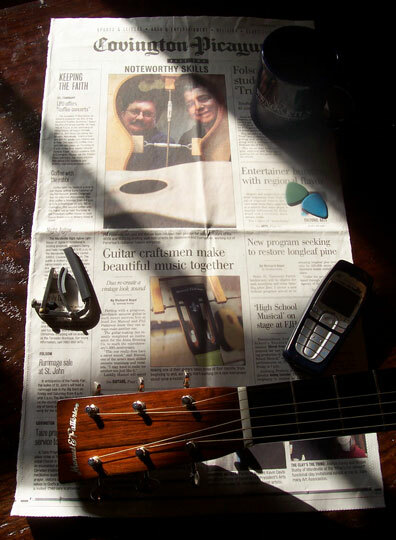 A guitar's top and bracing system is its voice. 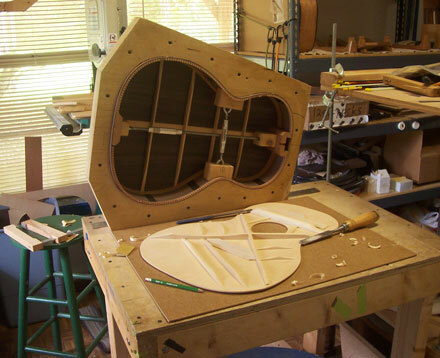 Prewar guitars often had perfectly placed bracing, with certain areas of the braces being scalloped. Scalloping, or the shaving of braces, allows the top to vibrate freely, resulting in a substantial increase of volume and purity of tone. Bracing in Manuel & Patterson guitars is carefully scalloped and shaped, which is part of the secret to their sweet and powerful tone. 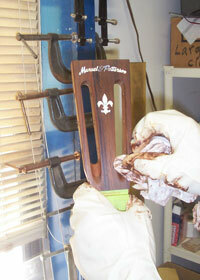 it takes as long or longer to apply the nitrocellulose lacquer finish. There is far more to this painstaking last step than many are aware of, and the finish not only protects and enhances the wood, but can have a dampening affect on tone if applied incorrectly. It's been said that a guitar maker's finish separates the men from the boys, and Joe's and Phil's guitars are finished to glossy perfection, showcasing their deep and beautiful grains and allowing them to resonate with equally beautiful tone. "Once a player steps up to a professional quality instrument, he can never go back, and it's the same with custom guitars. Once you step up to a high quality custom guitar, you'll never go back."